I called Mom and asked what Dad got her for Valentine’s Day and vise versa… Well one of her creative gifts was a bacon bouquet! I’d never heard of such a thing but a hit with the guys indeed! Mom just rolled thick bacon and put each roll in a muffin cup and baked for 20 minutes!! Start with good intentions. Don’t do it if it’s not what you feel is right in your heart. Bacon should evoke a visceral reaction within you and within your intended recipient, for greatest maximum impact. 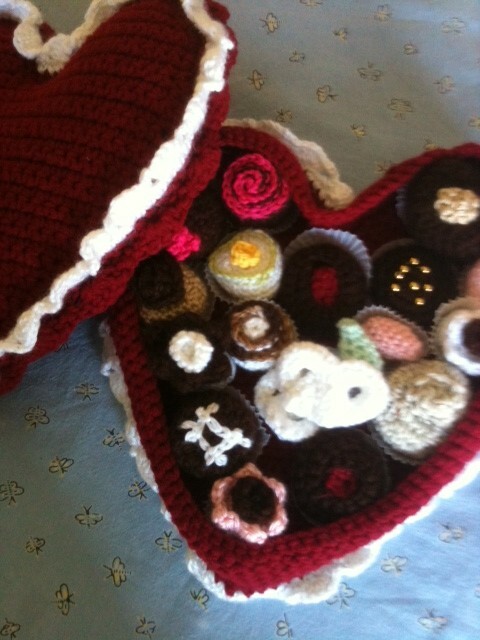 Mom got this pattern/idea from http://www.redheart.com/free-patterns/crochet-box-chocolates. RED HEART® “Super Saver®”: 4 Ounces 332 Ranch Red CA. RED HEART® “Luster Sheen®”: 2 Ounces 1 White CB. Crochet Hooks: 3.5mm [US E-4] and 3.75mm [US F-5]. 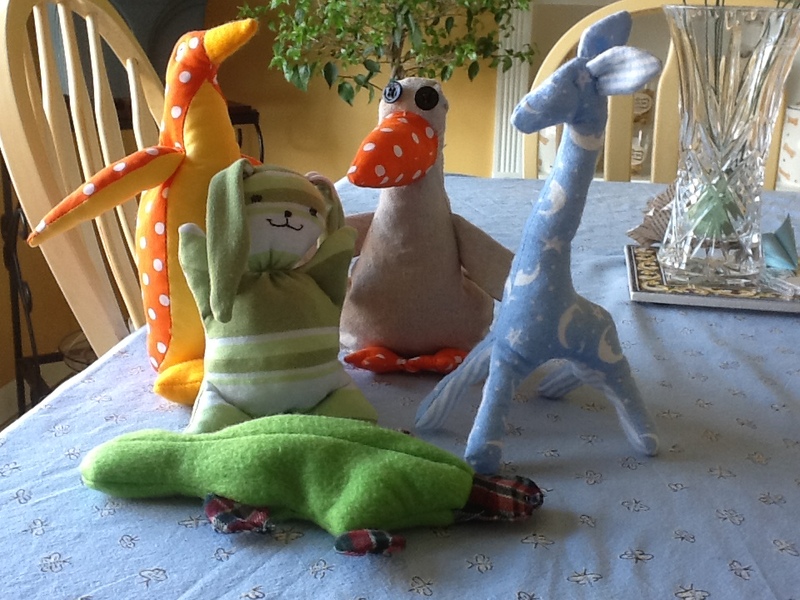 Yarn needle; small amount of polyfil stuffing; two 8″ x 11″ cardboards. RED HEART® “Luster Sheen®”: 1 Ounce 360 Chocolate CA, 3/4 ounce 7 Vanilla CB; small amounts 615 Tealeaf CC, 332 Tan CD, 227 Buttercup CE, 235 Think Pink CF, and 915 Cherry Red CG. Yarn needle, polyfil stuffing, 20 white paper candy cups, 20 tiny pearls. 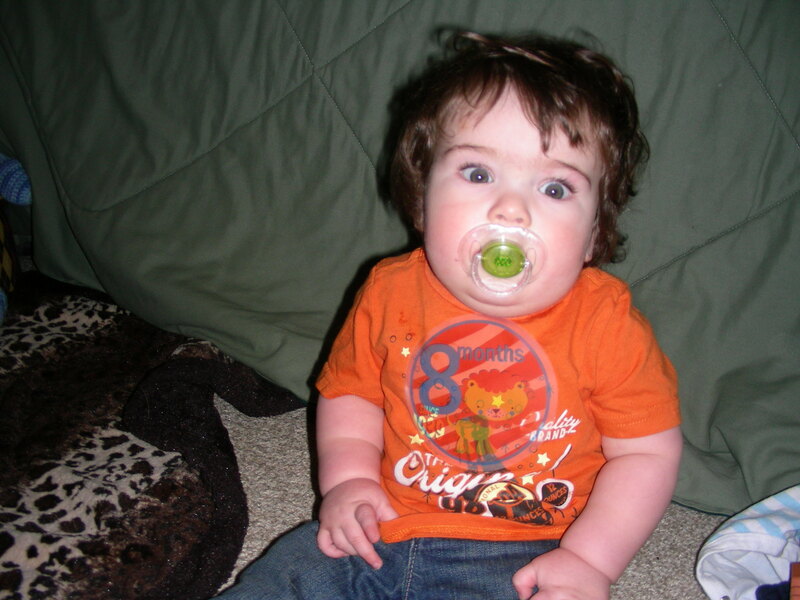 Box measures approximately 9″ across and 8″ from “V” to bottom point. Candies measure approximately 1 1/4″ across. ROUND CHOCOLATES (Make 2 CA with CF flower and CC leaves; 1 CF with CB flower; 1 CA with CB chain st tic tac toe embroidery). GAUGE: 16 sts = 4″; 16 rows = 3 1/2″ in sc with CA and larger hook. CHECK YOUR GAUGE. Use any size hook to obtain the gauge. GAUGE: 6 sts = 1″; 5 rows = 3/4″ in sc. CHECK YOUR GAUGE. Use any size hook to obtain the gauge. The lace trim looks great but when I commented on it Mom said it was a “bugger” to do! I love this idea, I asked Mom to make one for my son (1 year old) but he’d probably try and eat them since he does everything else! Good luck and let us know how yours turns out. Here is a great Valentine gift for a loved one! 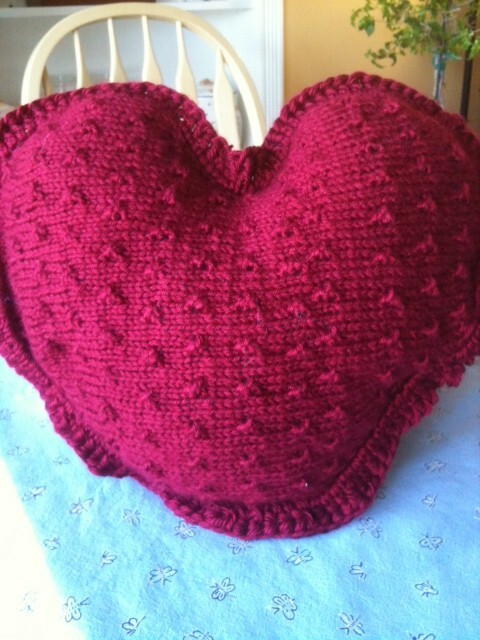 Mom found this heart pillow pattern at http://www.caron.com/projects/ss/ss_i_love_u_heart.html. She used the knitting pattern and just left the pocket off! Super cute and comfy cozy gift! Give it a try, and if you add the pocket… you can stick in a special Valentine card. I’m not the crafty one in the family but I decided I could paint wooden letters for my son’s room. I bought these letters from Michael’s because they were on sale. I paid under $3 each letter so it’s a pretty cheap project! I used acrylic paint and paintbrushes/sponges to paint the letters. They dried very quickly and in my opinion came out great! I bought a whole bunch of different colored paint but only ended up using the yellow and blue because I liked them best! Here is a picture of the finished letters. This is so very cute, I love it! I actually love everything Mom does and wish I was as artistic as she is! She’s been rolling the marquis shapes for the leaves for several days while watching tv that way it’s easier to roll so many! This is definitely a time consuming project but look how awesome it turned out! This quilling shape is sometimes also referred to as the Marquise or Eye Shape in some quilling patterns create this quilling shape as you would the Loose Coil quilling shape and simply pinch both the glued side and the opposite side of the quilled coil Pinch first one side and then the other while holding the pinched points one in each hand. This helps encourage a more even quilled shape.